The B34 is a totally new look for todays shredders. 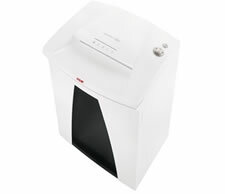 Document shredders have become an integral part of modern offices. Therefore, it is only appropriate that the B34 shredders are totally state-of-the-art in terms of their design, economic energy management (EMCS), absolute ease of operation use and low-noise in operation. These combined features produced a document shredder for the future office today. EMCS saves energy: the EMCS intelligent energy management system saves up to 70% power consumption compared to a standard standby switch. It can shred up to 32 sheets per pass.